Amie has been with us for almost 4 years. 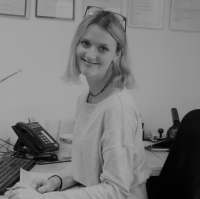 Amie’s role includes all day to day Lettings duties - Check ins and check outs, Inventories, Inspections, liaising with landlords regarding tenant contracts and booking routine inspections. Her incredibly friendly and approachable nature makes her a real asset to the team. As well as being hilariously funny, Amie has worked her way up from an apprentice role with us to a highly experienced Lettings Consultant. She has lived in the area all her life and knows Sleaford well.